The Olympia meeting kicked off a series of upcoming public discussions and state-tribal negotiations — called the North of Falcon Process — designed to approve this year’s salmon-fishing seasons by April 12. The effort involves commercial and sport fishing, tribal and nontribal. Harvest areas covered by the agreement are within Puget Sound, along the Columbia River and off the Washington Coast. While salmon managers are more optimistic than last year, they are quick to caution that most salmon runs remain low — even when compared to a recent 10-year average. 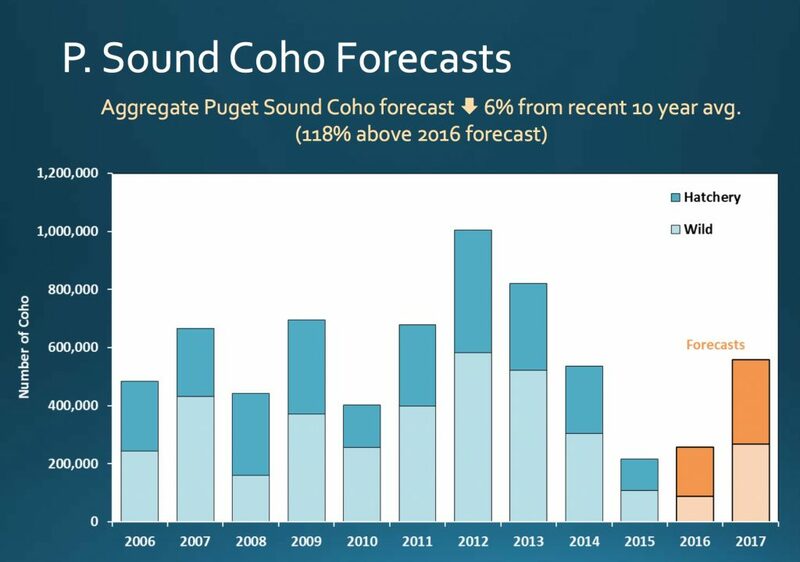 For example, the total number of hatchery and wild coho returning to Puget Sound is forecast to be 559,000, up from 255,000 forecast for last year — although last year’s actual returns were somewhat higher. But even that increased forecast remains 6 percent below the 10-year average, according to WDFW figures. Until the experts run computer models that calculate where fish will be caught under various scenarios, nobody wants to be too specific about how fishing might be restricted to protect the so-called limiting stocks. But typically fishing will be restricted in the Strait of Juan de Fuca and even the ocean to protect salmon returning to Northern Puget Sound. Fishing in South Puget Sound, on the other hand, could be expanded, because the impacts are not as great there. How bad is it? In the Skagit River, about 11,200 wild coho are predicted to return this year. That compares to a forecast of 8.900 last year but 121,400 in 2015. In the Stillaguamish River, about 7,766 wild coho are expected this year, compared to 2,800 last year but 31,300 in 2015. Anticipated runs of chinook — listed as a threatened species — are mixed, depending on the specific stream. 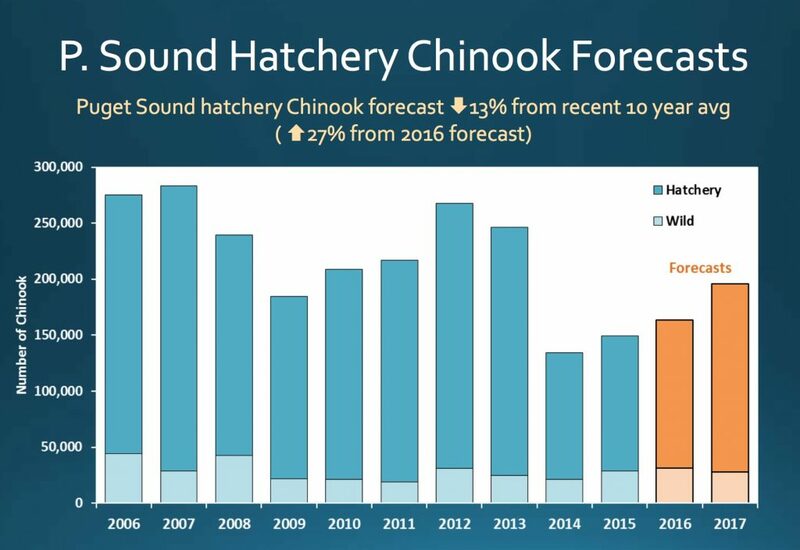 Overall, the forecast for wild chinook is down 10 percent from last year, while the forecast for hatchery chinook is up 27 percent. Salmon managers will be trying to protect wild chinook returning to the Stillaguamish, Nooksack and Dungeness rivers. Since 2017 is an odd-numbered year, we would expect to have good fishing for pink salmon, which have been doing well in recent years — but not so much this year. 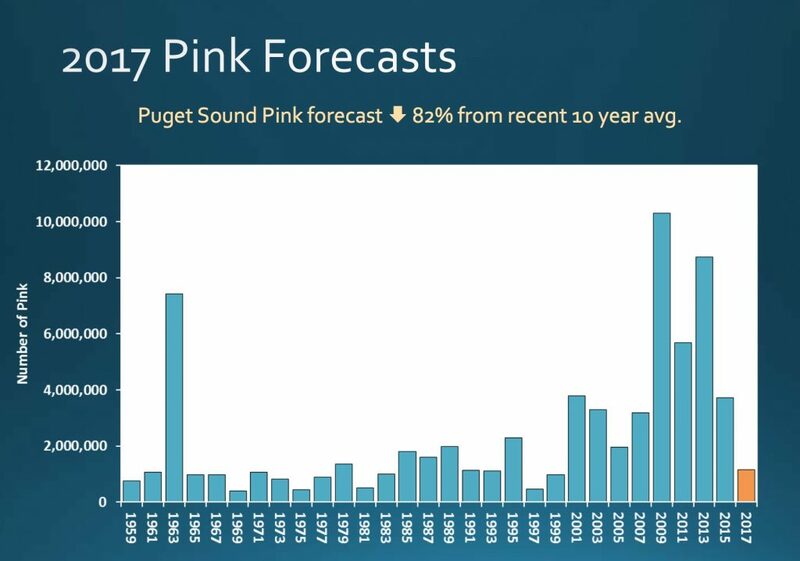 Two years ago, many of the adult pinks returning to Puget Sound rivers were hampered by low flows followed by floods. Experts are expecting the lowest run of pinks since 1999. 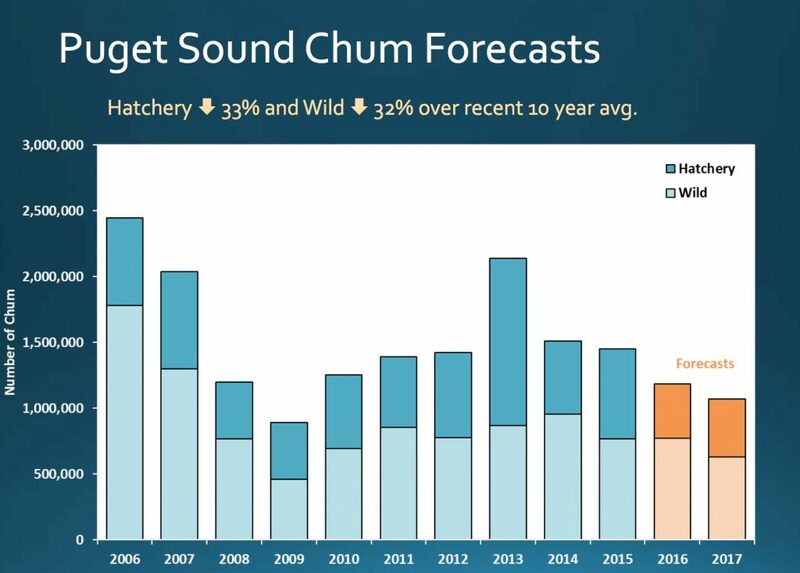 Fall chum salmon are continuing on a downward trend since a recent peak in 2013, but these fish are still doing well in Puget Sound compared to other species. Adicks encourages anyone interested to attend the upcoming meetings, which are listed on the WDFW’s North of Falcon website. Lorraine Loomis, chairwoman of the Northwest Indian Fisheries Commission, said state and tribal negotiators agreed to start the discussions early this year and try to resolve some general concerns. “Nobody wants a repeat of last year’s North of Falcon process that required a month of overtime negotiations and led to a delay in opening some sport fisheries,” Loomis said in her column in Northwest Treaty Tribes magazine. “It was the first time in more than 30 years that the co-managers were unable to complete the process in the usual late February through April timeframe. The size of the various salmon runs are tied not only to freshwater conditions, such as temperature, flow and clean gravel, but also ocean conditions and whether salmon — from fry to adult — can find food on their migration route through saltwater. Since 2013, warm water and a lack of upwelling in the ocean appear to have prevented the salmon from finding nutrient-rich plankton needed for proper growth, said Marisa Litz of WDFW. The recent shift from El Niño to La Niña to neutral conditions appears to be changing the ocean environment more to the liking of salmon. It may take a year or two before we see the benefits of the improved conditions, but at least hope is on the horizon, she added.